Keen players in the global acoustics market are vying to develop new applications for acoustic materials, especially in the transportation sector to up their market share and to steal a march on their competitors. Further, topnotch players in this market are seeking entry into emerging markets to capitalize on brimming growth opportunities in these regions. The acoustics market is primarily driven by government regulations in place in several parts of the world to curb noise pollution. This has necessitated buildings to be insulated with acoustic materials that can prevent noise to spread. While these regulations are already in place in developed countries, the relatively new implementation of these regulations in developing regions is leading to an uptake of acoustic material and products. For instance, in India in Andhra Pradesh, the Energy Conservation Building Code (ECBC) puts forth the requirement for commercial and public buildings to reduce energy consumption and to reduce noise pollution. On the flip side, scientific and technical expertise needed for production and deployment of acoustic materials is slowing the growth of the acoustics market to some extent. As per estimates presented by a report by Transparency Market Research, the global acoustics market will likely rise at a CAGR of 5.85% from 2017 to 2025. The report examines the global acoustics market based on material, end-use, and geography. Depending upon type, the market is classified into glass wool, stone wool, acoustic insulators, fabric dampeners, fabric noise barriers, foamed plastic, fabric wall materials, acoustic fabrics, fabric absorbers, fabric diffusors, fabric ceilings, and fabric soundproofing materials. Foamed plastic led amongst key acoustic material types in 2016 mainly because of its better insulation properties and relatively lower price. In terms of end-use, the global acoustics market can be classified into building & construction, industrial/HVAC & OEM, and transportation. Vis-à-vis revenue, the segment of building and construction occupied the leading share of almost 60% in the overall market in 2016. The building and construction segment is further sub-segmented into residential and commercial, of which residential occupies the leading share. Geography-wise, the report studies the global acoustics market across North America, Asia Pacific, Europe, Latin America, and the Middle East & Africa. Amongst all, Asia Pacific held the leading share of the market in 2016. The growth of this market is primarily on account of being home to some of the key emerging economies in the world. In this region, the rapid pace of migration from rural to urban areas is leading to an increasing demand for residential and commercial buildings. This, in turn, is benefitting the acoustics market to provide the necessary insulation in these buildings to curb noise pollution as mandated by environment conservation statutes. Asia Pacific is also home to China, which is one of the leading individual markets in the world. Driven by these factors, Asia Pacific acoustics market is anticipated to expand at a significant CAGR over the forecast period. Similarly, Latin America and the Middle East & Africa also constitute some key emerging economies that are witnessing rapid urbanization. The demand for new residential and commercial buildings in these regions is expected to immensely benefit the acoustics market. On the other hand, North America and Europe are mature markets for acoustics as regulations for noise pollution to be within permissible limits are in place for a long time. Hence, these regions will witness a slow growth rate over the forecast period. Sika AG, Rockwool International A/S, DuPont, Knauf Insulation, 3M Inc., Saint-Gobain, BASF SE, and Fletcher Insulation among other are the key companies that operate in the global acoustics market. The report comprises a detailed value chain analysis, which provides a comprehensive view of the global acoustic materials market. Porter’s Five Forces model for the acoustic materials market has also been included to help understand the competitive landscape in the market. The study encompasses market attractiveness analysis, wherein end-users are benchmarked based on their market size, growth rate, and general attractiveness. The report provides the estimated market size of acoustic materials for 2016 and forecast for the next eight years. The global market size of acoustic materials has been provided in terms of revenue. Market numbers have been estimated based on Material, technology, and application segments of acoustic materials market. Market size and forecast for each major Material, technology, and application have been provided in terms of global and regional markets. Secondary research sources that are typically referred to include, but are not limited to company websites, annual reports, financial reports, broker reports, investor presentations, and SEC filings, internal and external proprietary databases, and relevant patent and regulatory databases, national government documents, statistical databases, and market reports, news articles, press releases, webcasts specific to companies operating in the market, American Chemical Society, International Council of Chemical Associations, 4m Associations, and European Union. Primary research involves e-mail interactions, telephonic interviews, and face-to-face interviews for each market, Material, segment, and sub-segment across geographies. We conduct primary interviews on an ongoing basis with industry participants and commentators in order to validate the data and analysis. Primary interviews provide firsthand information on market size, market trends, growth trends, competitive landscape, and outlook, etc. These help validate and strengthen secondary research findings. These also help develop the analysis team’s expertise and market understanding. The study provides a decisive view of the global acoustic materials market by segmenting it in terms of Material, technology, and application. These segments have been analyzed based on present and future trends. Regional segmentation includes the current and forecast demand for acoustic materials in North America, Europe, Asia Pacific, Latin America, and Middle East & Africa. The report also covers demand for individual Material, technology, and end-user segments in all the regions. The study includes profiles of major companies operating in the global acoustic materials market. 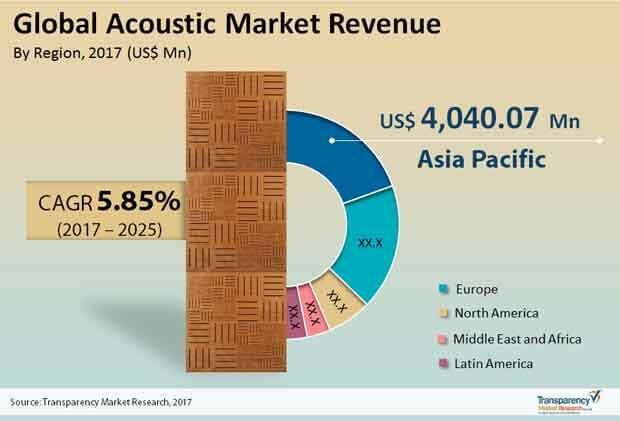 Key players in the acoustic materials market include 3M Inc., Sika AG, Saint-Gobain, Rockwool International A/S, BASF SE, DuPont, Fletcher Insulation, and Knauf Insulation, among others. Market players have been profiled in terms of attributes such as company overview, overall revenue, business strategies, recent developments, and SWOT analysis.